*This was originally written/ published in 2011; one of the first blogs I ever wrote and before I found my niche. It was a profound snippet in my life then, and now, upon his death, a nostalgic and touching reminder of how lucky I was to have had that snippet. Muhammad Ali and I shared a moment. It’s true. It was the year 19__, and I was in my senior year at SUNY Brockport, in upstate New York. For some reason no one could figure out, our college was chosen as the first official location of the Special Olympics. It was to be an impressive affair and I don’t think anyone at our school was prepared for the spectacle or the outpouring of celebrities, sports figures, TV stations and huge throngs of special needs kids carted in from all over north western New York to participate. Everyone from Eunice Shriver, Teddy Kennedy, Sally Fields, Christopher Reeves, Susan St. James, and more were there, and it was filmed by WABC Wide World of Sports, featuring The Gif! (Frank Gifford) as the official announcer of the games. 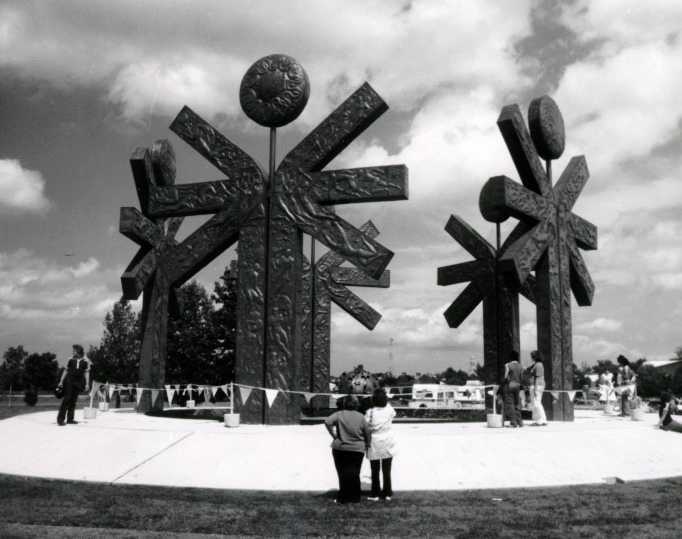 About 2 weeks prior to the games start, a huge sculpture was delivered to our campus and erected in front of the library- a gift from the U.S.S.R. See below. Woah. This was our first hint of just how serious an affair this was going to be. Because I was a communications major, I had been interning for WBTV, our humble campus TV station, and we in turn had the honor of interning for WABC Wide World of Sports as they set up and filmed events taking place all over the campus. For the most part, this entailed standing around and gawking at all the celebrities as they showed up for the shoots, the games and the awards, as the network TV unions would not allow any college kids to touch any of their equipment or cables. Union rules. It was exciting though, and we’d scored a cool gig. Two days into the games, I was assigned the uber cool gig of “setting up”, (aka: standing around and watching them set up), a boxing ring in one of the gyms where a mystery guest was going to be “fighting” the ‘ guest contestants’. That mystery guest turned out to be none other than Mr. Ali himself, and as he made his way up into the ring, all by his lonesome ( where were his “people”?) to test it out I just happened to be standing right by it, gawking and asking my fellow student gawker if that really was who we thought it was. There was no mistaking him however, as he loomed so large, with such an imposing presence that the whole gym, filled with about 30 interns and union guys suddenly became so silent you could hear a pin drop. I remember thinking that something big was about to happen, although I had no idea what. Then he was by himself, walking laps around the ring, until he took a seat on a small stool set up in one of the corners. I stood there watching him, and suddenly he said to me, very softly, “Come here, young lady!” As I looked around to see who he was speaking to, he said it again, and when I turned around to face him he gestured to me. To say I was a bit intimidated was an understatement; after all this guy was the size of a Volkswagen Beetle- A Volkswagen Beetle with a very soft husky voice that didn’t seem to match his size. So I climbed up into the ring and we had a moment. He asked me what I was doing there, and a few other questions which seem to allude me, and forget remembering my answers- I’m sure I just mumbled something incoherent… but here’s what I do remember: when he noticed how nervous I was, he reached out and took my hand-my right hand-and holding it between his 2 mammoth paws (honestly, they were like hardened baseball mitts), held my hand up to his mouth and gently kissed the back of it as though I was Princess Grace of Monaco. And he said this: “Little girl, there is no reason in hell why you need to feel nervous in front of me. I am your friend. Do you understand?” And that was that. I think I must have nodded like a bobblehead. He then very gently kissed my left hand, and just as if it had never happened, I floated out of the ring and held my hand. Then the other one. I’m sure I looked a little odd, standing there, holding my very own hands. That happened. About 15 minutes later, the volunteers began filing in with the kids, to get up into the ring and spar with The Champ. A few didn’t know who he was, but could tell he was someone very important; you could see the delight in their eyes as one after the next had the chance to KO this imposing presence. For the ones who did know him, the air became electric. It was a moment that wouldn’t be duplicated ever in their lives and they felt that. Time and time again Ali let these kids run him around the ring, chasing him down with their huge gloves flailing, a few leaping yards onto him, and he seemed just as gleeful, just as in the moment as they were, as though he too was a kid again. He moaned, he swayed with drama, he wobbled around in circles, he held his side and cried out as their ineffectual crazy punches which must have felt lie a flea bite landed on his torso, his legs, and a few times he even encouraged a little face contact. I winced when that happened- that beautiful face. It was a beautiful thing to watch. With The Gif announcing the action, this heavy weight champion of the world, the best of the best, the guy Seth Godin in Permission Marketing says “did not become heavyweight champion of the world by punching 20 people one time each. He became the champ by punching one guy 20 times”; a guy whose reputation as the meanest, toughest SOB in the game, how this guy stood there and play acted with everything he had with over 50 special needs kids, letting every one of them win rounds, and the match, each and every time, was nothing short of amazing. Each time the “ref” would come around and declare the kid a winner, Ali would lie there on the floor of the ring, pretending to be too tired to even lift his head, but you could hear the groans. The kids (and us gawkers) squealed and laughed, and were able to feel great about themselves, like champions, and were paraded around the ring, boxing gloves often as big as their arms, held high by the refs, sporting a towel with a large “C” for Champion around their small shoulders. A few had to be dragged out of the ring, if memory serves me correctly. Their 15 minutes. An amazing gift, this huge heavyweight champ of the world was giving them. I’m sure he knew it. I’ve never forgotten that day, and I think back every now and then wondering how many of those special needs kids who are still around today and in their 40’s remember their big moment in the ring with Ali. And if that moment remains for them the best moment of their lives to date. And if Ali really understood the magnificent gift he gave us, me included, but especially the kids, who each had their moment in the ring with Muhammad Ali. 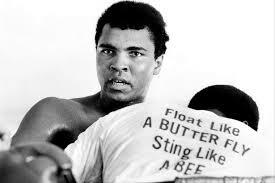 R.I.P Champ. You truly were “The Greatest”. I’ve got goosebumps all over, Suzen. How lucky to have been touched by and witness to such greatness. Well told! Thanks for sharing this. Thanks Jane. It definately was one of those few life changing experiences! What a story. People always talk about Ali as being such a nice human being. As opposed to what we just learned about Steve Jobs, who was smart, but not a nice person. He new bio also gave me goose bumps! Thanks Stephen…no one could ever figure out why we were selected! It was SUNY Brockport. Yes, he was a pussycat! Ali was a legend and a genius. What a privilege to have met him — even for a moment. Would we not have imagined a different scene from “The Greatest”? Lo! He is humble and a servant saying, “I am your friend. Do you understand?” And willing to spend a day giving the special children their day of delight. Suzen, thanks for another one of your well-told stories from your beautiful life. Great story, Suzen. Touching peoples lives is what it’s all about. We can all do it on some level, but not the same level as Ali; but it’s nice to think that if we each reach out to help whomever we can, it is significant. You shared your story which in turn may help some us make an impact on another human being. How come you never told me about this encounter? I now look at you in a different light. Interestingly enough your baby brother also had an Ali moment. Be and the parental units were traveling South to Florida and stopped in a hotel for lunch. Mr.Ali and his wife arrived shortly after they did and sat at a nearby table. His physical prowess was not as you described him. Instead he was an older man with progressing Parkinson’s disease. While everyone waited for their orders the staff members from the kitchen filed out one by one or occassionally in small groups with paper napkins and pens. Mr. Ali was kind and generous with his time to each of much like your story. After the food arrived your brother figured the onslaught of fans would show a little consideration, but they kept coming. Still, Mr. Ali was gracious and giving of himself. Finally the croud thinned and Mr. Ali was alone in the dining area with his family and yours. Your brother could have taken the opportunity to get an autograph and a introduction for himself, but he decided the gentle giant had done enough and deserved the respect of eating his meal in peace. So, I guess Mr Ali and the Gluck family have crossed paths on more than one occassion. we really need to talk more often…. Yes, he was a true example of branding. He needed to portray a certain tough exterior (to say the least! ), but that wasn’t at all who he was. The ring was his job! Thanks for the comment Sharon. I look forward to working together. as you should, dear Phil, as you should…. Thanks Barbara. You gotta hope! All the best..
You’re welcome Tim, and thanks. It’s true—and I just happened to be in the right place at the right time! Ha! Paul, I think you missed your calling! 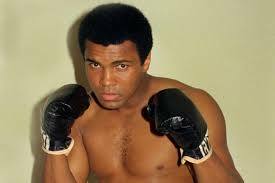 “did not become heavyweight champion of the world by punching 20 people one time each. He became the champ by punching one guy 20 times” and this theme transcended into his personal life too.Those on top of the mountain did not fall there! A great read – thanks Suzen! I LOVE IT !!!!! someday sooon…i will get the photos out of the cabinet and scan them in so i can post the pics…WHAT AN INCREDIBLE TIME IN OUR LIFE !!! !